Photo courtesy of Joshua Project. 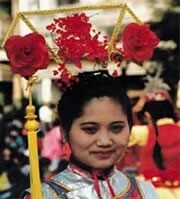 Overview: The Manchu are an Altaic people who used to dominate Manchuria, in northeastern China. In 1611, they conquered the whole of China, and Manchu emperors ruled China as the Qing Dynasty until 1912. During those three centuries the Manchu were largely absorbed into the Han Chinese, though they have retained some of their cultural distinctions.